The Spread Offense Gets A Shot In The Arm From... The NFL's Miami Dolphins?? The spread offense in college has been sort of taking it on the chin the last few weeks, with the likes of Auburn and West Virginia having a difficult time getting their offenses in gear so far (Thank God for Missouri...what an offense that is!) this year. Then out of the clear blue, this past Sunday saw the emergence of the 'South Florida Spread' (no, not Matt Grothe and the USF Bulls in Tampa), the Miami Dolphins! That's right, the Dolphins of the AFC East took the New England Patriots behind the wood shed with some solid defensive play and a taste of the Arkansas 'Wild Cat and Wild Hog' Offense made so famous by Darren McFadden and Felix Jones. In this case, it was Ronnie Brown who was in the shot-gun orchestrating the famous spread offense formation, surely under the tutelage of Miami's quarterback coach David Lee, from you guessed it... The University of Arkansas. On Sunday, Brown gained 113 yards on 17 carries and the Dolphins out gained the Patriots 461 yards to 216. 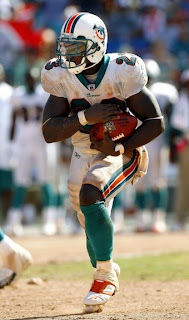 Ronnie Brown, typically used as a tailback, received six direct snaps resulting in four touchdowns (three runs, one pass). This will be interesting to see how it develops as the year goes on, will you see this package every week by Miami? Will other pro teams consider trying this or a similar spread offense/single wing package with a great athlete? Time will tell... remember our prediction on the college spread offense making its way into the NFL - click here - Maybe it'll happen sooner!